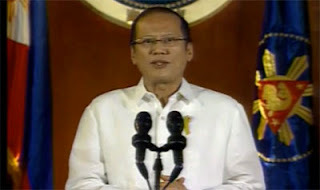 The Full-Text of the President's Address to the Nation in English version can be viewed here. If you like to watch his Address to the Nation? you can find the video link below. My beloved countrymen, good evening. Over the past few months, a few topics have come to be the focus of public discourse. With the cacophony of discordant voices coming from many different sides, perhaps the subject of the Pork Barrel and DAP has begun to leave you confused. I am asking you for a few minutes of your time in order to bring clarity to these issues. You are all witnesses to the conflict taking place. On one hand, there is you and your government, to whom you gave the mandate for change—a government that has implemented reform for the past three years and five months, pursuing the corrupt and working to alleviate poverty. On the other side, you have the corrupt officials allegedly involved in the Pork Barrel Scam. One would have hoped that out of respect for those who believed in, and voted, for them, these officials would have fulfilled their sworn duties. At the very least one would have expected them to explain how it happened that the beneficiaries of the NGOs they chose to fund was just a list of board passers seemingly culled from newspapers. But how can we take their excuses seriously, when after repeated instances of their giving money to the same NGOs, they had not once bothered to check if the funds they allocated actually reached the intended beneficiaries? This state of affairs is indeed difficult, even impossible, to explain away. And since it is exceedingly difficult to explain, it seems they have taken the advice of an old politician from their camp: If you can’t explain it, muddle it; if you can’t deodorize it, make everyone else stink; if you can’t look good, make everyone look bad. You have heard what they are saying: that we are all the same. My response: We are not the same. I have never stolen. I am not a thief. I am the one who goes after thieves. We appointed people of unquestionable integrity who are fulfilling their sworn duties. Did we not appoint the Commission on Audit leadership that reviewed the documents leading to the discovery of PDAF abuse? And now, can we not expect a fair and just investigation, because the Ombudsman we appointed walks alongside us along the straight path? Let me make it clear: The Disbursement Allocation Program is not pork barrel. Of the DAP releases in 2011 and 2012, only nine percent was disbursed for projects suggested by legislators. The DAP is not theft. Theft is illegal. Spending through DAP is clearly allowed by the Constitution and by other laws. DAP is only a name for a process in which government can spend both savings and new and additional revenues. Where did these funds come from? They came from our efforts to stop the connivance of some in bidding for contracts, in padding costs, overpricing, and kickbacks. They came from the proper spending of our budget. They came from good governance now seen in our GOCCs; just one example of this is the MWSS, an agency once buried in debt, and which now remits dividends to the national government annually. Savings, above-target collections, and new revenues are the results of good governance. And because of DAP, these funds were allocated to projects that were within the proposed budget and that had a clear benefit to the country. How does this mechanism work? Simple. There are some agencies that, for a variety of reasons, are unable to implement their projects right away; on the other hand, there are those that are very efficient in implementing their projects. When projects are stalled, naturally, we will not spend for them. We did not allow these funds to remain dormant. We looked for programs under implementing agencies that had proven themselves to be fast and efficient, and we channeled our savings into these programs—together with the additional revenue of the government. The benefits of these projects reached our countrymen faster and earlier, and we were able to spend the money allocated yearly in our National Budget more prudently and efficiently. You can decide for yourselves: Is this wrong? When has it ever been wrong to look for a constitutional way to serve our countrymen more effectively? DAP funded Project NOAH, which gives accurate and timely warnings during calamities. Also because of DAP, under the Training-for-Work Scholarship Program of TESDA, almost 150,000 Filipinos were able to study, and no less than 90,000 of them are currently employed. DAP also benefited our Air Force and the police. Through DAP, we were able to construct infrastructure in Mindanao and other parts of the country; restore the benefits of DepEd employees by paying their GSIS premiums, which had long been unpaid by the government; and fund many other programs and projects that have a real, tangible benefit to Filipinos. DAP also played an important role in our economic resurgence. According to the World Bank, DAP contributed 1.3 percentage points to our GDP growth in the fourth quarter of 2011. Let us compare: isn’t it true that, when they were still in power, we were called the “Sick Man of Asia”? Today, we can choose from a number of new labels: Asia’s fastest growing economy, Rising Tiger, Brightest Spark. And let’s include the investment grade status we received from the three most reputable credit ratings agencies in the world. This economic growth—and its positive effects, which have redounded to our countrymen, especially those in the margins of society—this is the product of principled spending, and not of stealing. Money once pocketed by the corrupt is now being used to help our people, particularly the poor. Let me also take this chance to explain the President’s Social Fund. There are times when we will need funds that can be disbursed quickly to meet sudden needs. For example: we needed funds to provide assistance to the families of soldiers and policemen who fell in the line of duty while responding to the threat posed by the MNLF-Misuari Faction in Zamboanga. There were also those who fell in the course of rescue and relief operations in the wake of Typhoon Sendong. The PSF funded these; without it, without calamity or contingency funds, they would have continued to suffer. Because these funds were abused in the past, people are saying that perhaps we will abuse them today—even if no one has accused us of stealing or of using them in the wrong manner. Some propose to remove them completely. Would this be just? If only it were that simple—but what would we then do in case of natural disasters? Even if we were lucky and Congress was in session, it would take at least four months of debate before Congress can approve the funding we need. If you are in Zamboanga, with a child crying from hunger, and government tells you that it cannot help you just yet, it would need to haggle with Congress first—how would you feel? We have the money, and we have the mechanisms that will ensure this money goes where it’s needed most. Would it be right to deprive our countrymen of the care they direly need? I repeat: The issue here is theft. I did not steal. Those who have been accused of stealing are those who are sowing confusion; they want to dismantle all that we have worked so hard to achieve on the straight path. We were stolen from, we were deceived—and now we are the ones being asked to explain? I have pursued truth and justice, and have been dismantling the systems that breed the abuse of power—and yet I am the one now being called the “Pork Barrel King”? This is what I say to them: If you think that this will stop me from going after you, if you think that you can divert the public’s attention, if you think you can get away with stealing from our countrymen—you have sorely underestimated me and the Filipino people. If there still remains some vestige of kindness in your hearts, I hope that you stop acting in self-interest, and instead act to help your fellowmen. When my father returned home on the twenty-first of August 1983, he had a speech prepared. Filipinos never got to hear it, because he was murdered right on the tarmac. In that speech, he quoted Archibald MacLeish: “How shall freedom be defended? By truth when it is attacked by lies.” Now that falsehood and deception are threatening the Filipino’s right to a clean and honest government, the truth stands as our most powerful weapon. Tonight, I laid out the truth of what has been happening in our nation. I hope that in the coming days, you will talk about this amongst yourselves—in your families, in the groups you belong to, between friends and colleagues, within your communities—and that you can arrive at an understanding and a resolve that aligns with the truth. My Bosses, we have fought so many battles. And I am grateful that no matter how foul the slander and the sabotage, you never let go, you never gave up. Together we proved that there are no tyrants if there are no slaves. Now, those who have abused our trust want to cast us off the course towards the fulfillment of our collective aspirations. I do not believe that you will let this pass. And so long as you are with me, I will continue to stand for our principles. I have no doubt that, whether or not I am in office, you, our Bosses whose minds and hearts are in the right place, will continue and will finish the fight. This knowledge is the source of my strength and my courage. After all, is it not true that, not too long ago, the system in place was one where the Filipino people had grown tired of dreaming, of fighting back, of doing their part? Today, there are so many of us who are collectively forging the positive and meaningful reforms that are taking place in society. I have every confidence that you will more actively choose to be on the side of what is right, what is truthful, and what is just. This is why I am thankful today, because I know that we will continue our march on the straight path. For the meantime, please bookmark this page now or visit this site more often for you to be updated. You may also share this post to your friends so they may know about President's Address to the Nation on Wednesday, October 30, 2013. Comments or suggestions about "President's Address to the Nation in Full-Text English version" is important to us, you may share it by using the comment box below.